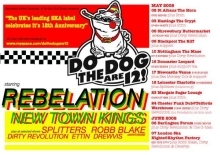 Do The Dog have been promoting ska music in the UK for twelves years now and to celebrate are undertaking an anniversary tour in May and June. Record label, ‘skazine’, live promoters and CD mailorder service: Do The Dog really know how to push new ska music to a wider audience, so expect this tour to be as top notch as ever. Rebelation and New Town Kings will be performing at all dates, with a revolving support at different venues including Splitters and Robb Blake. For more see the Do The Dog website here and Myspace page here.